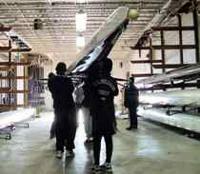 The Dee Campbell Rowing Center, home of the TC Williams High School Crew, is a modern and well equipped boathouse on the Potomac in Alexandria. 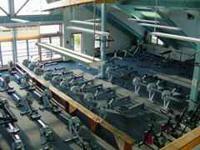 Built for the TC Williams Crew and occupied in September 1986, the Boathouse was named in honor of long-time TC Williams coach De'Arcey "Dee" Campbell in June 2006. It's one of the finest rowing facilities in the country, and one of the few owned by a public high school. The Boathouse has three spacious boat bays, holding racks for doubles through eights, flyspace for singles, oar racks, a workshop and space for storage of launches. Upstairs is large training room overlooking the river outfitted with 50 Concept II indoor rowers (or "ergs"), weight training and other workout equipment, locker rooms, coaches' offices, the Crew Closet and storage rooms. On the third level is a loft for meetings and additional workout space. The dock consists of four piers at the apron, ramps to floating pier extensions, and the floating dock where the shells and sculls are launched. It was extended into the river during August 2005 to provide needed depth and minimize the need for periodic dredging. In August 2007, the wooden launch dock was replaced with a modular system made of polyethylene, which should last longer and be slip-resistant. Established traffic patterns and safety procedures ensure that the dock can accommodate numerous crews even during the busiest practice periods. Ten years later, a full dock replacement plan is in the works for the 2018 season. 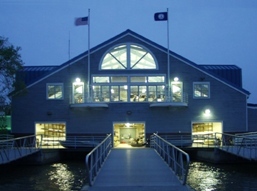 The Rowing Center is owned and maintained by the Alexandria City Public Schools for the use of TC Williams Crew, and is also used for adult and off-season youth rowing programs sponsored by Alexandria Crew Boosters (ACB) and its affiliate Alexandria Community Rowing (ACR). Suspended from the ceiling near the main floor training room is the "Dee Campbell," a wooden Kaschper eight-oared shell that, like its namesake, served Alexandria public school rowers well. 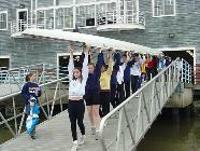 The Dee Campbell Rowing Center is located in Old Town Alexandria. From Washington Street -- which is the in-town portion of the George Washington Parkway that runs from National Airport to Mount Vernon -- turn onto Madison Street in the direction of the river. The Boathouse is at the very end of Madison. Click here for a map and directions.